It's wintertime and although a nice hot soup always hits the spot, it seems like some of us (me and husband but mostly husband) crave cold fattening things like ice cream! But recently, after trying shaved ice from Snowdays Shavery (thanks Susan and Simon!) I have been craving something cold myself even on one of the coldest nights in January. We were not the only ones. When we walked into the small East Village shop, there were no seats available and half of the customers were enjoying their frozen treats standing up. Jackets on and everything. I was surprised they would remain open for the winter but I’m happy they are. I tried only one of their many shaved ice combos (The Seoul) and went back for more of it a week later. It is a messy but delicious mix of black sesame and green tea matcha shaved ice garnished with fresh mangoes, mochi balls, red bean and drizzled with condensed milk and powdered with crushed almond. Nothing I don't like! I tried only one of their many pre-curated shaved ice combos (The Seoul) so far and went back for more of it a week later. 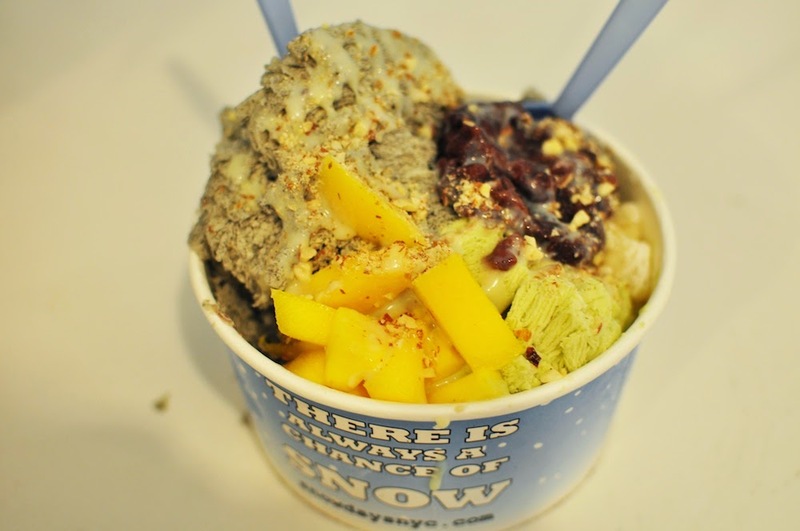 It is a messy delicious mix of toasted black sesame and green tea matcha shaved ice garnished with fresh mangoes, mochi balls, red bean and drizzled with condensed milk and powdered with crushed almond. Nothing I don't like about it! These creamy shaved ice are very popular in my native country of Taiwan so I’m happy it’s finally made it here and apparently really big in the west coast right now. The shaved iced here is a bit more sophisticated since we’re in Manhattan after all. These artisanal ice are made with organic dairy from Hudson Valley and all the snow cream are hand-made daily on premise with fresh ingredients. Goodness comes with a price. The combos start at $6 for a regular size shaved ice, it's better I don't eat these too regularly especially when the large ($7) or yeti ($9) size is the right size for sharing (I guess $4.50 per person isn’t so bad right?). There is also an option to build your own shaved ice starting at $5 for a regular size shaved ice and adding 0.50$ for each topping and 0.25$ for the drizzles. I'd probably go over $10 if I had my way. I would go back for more often if the shop was just a bit closer to home but maybe it's a good thing I take a break from these ice-y treats until it is warmer out. Mmm or maybe not.